Newtonmore scored at each end of their Badenoch derby against Kingussie to register a 2-0 victory which extended their lead in the Marine Harvest Premiership to three points over Kyles. This also brought Kingussie two points nearer the relegation play-off place after Oban Camanachd gained ground with a 2-1 success over Camanachd Cup winners Lovat. Glenurquhart consolidated third place with a 3-1 home win over Fort William in the Great Glen derby and Inveraray became even further detached at the bottom after losing 4-0 away to Lochaber. Skye celebrated the presentation of the Marine Harvest National Division trophy and their earlier promotion to the Premiership with a 6-1 victory over Beauly in front of their home crowd in Portree. The prolific Jordan Murchison contributed a hat-trick in just five minutes of play. Glen MacKintosh gave Newtonmore an early lead against their local rivals with a goal in the fourth minute. However, the game remained in the balance until the third minute of stoppage-time when Norman Campbell put the points in the bag for More. They are now three points clear of Kyles who had no game, and both sides have five still to play. 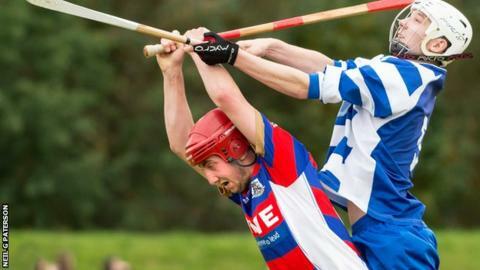 Lovat, possibly still hung over from their Camanachd Cup triumph there a week previously, returned to Mossfield Park, this time to meet an Oban Camanachd side desperate for points to escape the play-off place. Oban opened early with a goal from Daniel Cameron and Calum MacAulay soon equalised but Cameron grabbed Camanachd's vital winner in the second half. Camanachd remain second bottom but now just two points adrift of Kingussie and with three games in hand. At Drumnadrochit, Connor Golabek and James MacPherson had Glenurquhart 2-0 up within the first quarter hour. Neale Reid made it 3-0 in the latter stages before Victor Smith pulled one back for Fort. Early goals from Stuart Callison and Kevin Ferguson and one in each half from Sean Nicholson secured the points for Lochaber and compounded Inveraray's misery. Murchison's ongoing goal spree has been the cornerstone of Skye's historic season. After Shockie MacLennan and Iain Nicholson paved the way against Beauly, Murchison's quick-fire treble put the game out of reach before Kenny Campbell got number six just 60 seconds later. Liam MacDonald scored four in a 6-1 home win against Ballaculish for runners up Kilmallie who will have to wait until the end of November to dispose of their play-off due to the much longer Premiership programme. The Bullough Cup for the South reserve championship went to Tayforth with a 4-2 victory over Kyles.